A few weeks back, I was blessed to attend the Orange Conference with some members of the Kid's Ministry team at c|LIfe. Orange is a conference for all kinds of ministry leaders. The speakers were awesome. The closing speaker on Friday was Perry Noble. I had been introduced to Perry through the EntreLeadership podcast. I knew he had a new book out called The Most Excellent Way to Lead. I was excited to hear from him in person. He's from South Carolina. Ryan's family is from South Carolina and it's the home of Clemson, two things I love, so Perry already was in the positive. I was excited to hear him speak in person. He did not disappoint. He spoke about leadership. He was funny. He was insightful. He dislikes camping ("why do I want to spend my time pretending to be homeless" Preach! My food should not be prepared near dirt!). He loves Jesus. I'm in. I subscribed to his podcast - Perry Noble Leadership podcast. The first episode to pop up in my feed was called Coach vs. Critic. In this episode, Perry talked about a chapter from his book, The Most Excellent Way to Lead. It really got me thinking. I'm so glad we (Kid's Min at c|Life) bought the book and I can't wait until it's my turn to read it. Perry's point on the podcast is that, as leaders, we will be criticized. It's part of the deal, it's inevitable. But the most effective leaders know what criticism to listen to. He says we need to listen to our coaches, not our critics. 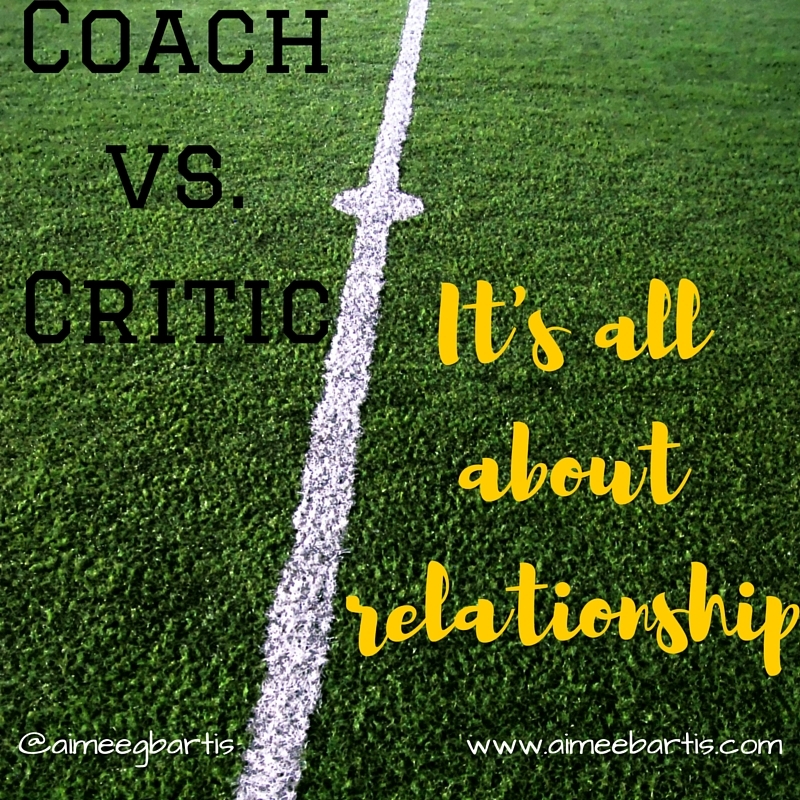 The difference between a coach and a critic is relationship. A coach cares about us. A coach wants us to grow and become better leaders. A critic wants to complain. It's about relationship. 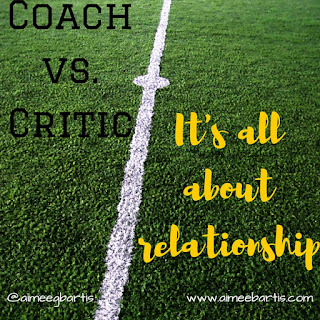 We have a relationship with the coaches in our lives. We are not in a relationship with critics. Throughout the podcast, Perry uses the example of Clemson football coach Dabo Sweeney. I'm a big Dabo fan. Perry highlights all the ways that Dabo coaches his players to get the best out of them instead of criticizing them. It made me think of my boys, their sports and their coaches. I have been asked in the past if it bothers me when coaches yell at my boys. 9 times out of 10 the answer is no and it's because of relationships. My boys have been coached by my husband and my brother in law most of their lives. These two men, and others who have joined them along the way, have wonderful relationships with my boys. They love them. They know them well. They are on their side. They want them to play well but also because better because they competed. To be honest, there have been men along the way who have not been most interested in my sons but in the games my sons can help win. It's all about them - their ego. Let me tell you how to spot these dudes. Rings. Most of these in-it-for-them dudes will be wearing a large championship ring. Not a gorgeous ring they earned for winning a football conference championship or bowl game in college. Not even a beautiful ring they earned at their actual job coaching kids to a high school state championship. No sir! These self centered guys are wearing pee wee football championship rings. Rings to signify that they coached a group of 5-13 year olds and beat all the other teams of 5-13 year olds in their geographic area. These men are critics. They don't have a relationship with my sons. They want to but they can't because it's difficult to be in a relationship when you're only worried about yourself. We've tried to steer clear of these guys. As Sam moves to high school and Zac starts middle school sports, I am confident that the coaches there care about them too. It's one of the many benefits of being in a small district in a small town and working for the district. I know these men. I am confident that they want to make my boys better players and better men. Yes, they want to win but not at all costs. Certainly not at the cost of my boys. God's plan has always been for us to be in relationship with one another. We are supposed to be loving one another. Learning from one another. Serving one another. Helping one another. To do all this we must care about one another. In Mark 12, Jesus is answering questions from Pharisees and Sadducees and scribes. They were trying to trap Jesus with questions. They asked Jesus which commandment was the most important. We are to love GOD first then love others as yourself. I don't like to be criticized, I prefer coaching. If I love someone as I love myself, I should coach them, not criticize them. But first, I need to build a relationship with them. You can get more info on the Perry Noble's podcast here. You can buy Perry Noble's book The Most Excellent Way to Lead here. I don't get anything from either link but you'll get great info!